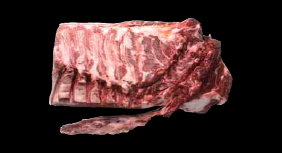 The chuck roll is the forequarter portion that is cut between the 6th and 7th rib perpendicular to the dorsal line excluding the shoulder clod and the brisket. It is divided into the chuck and the neck. The chuck roll can be well-marbled and the meat is tender and tasty making it perfect for sukiyaki and barbecuing.